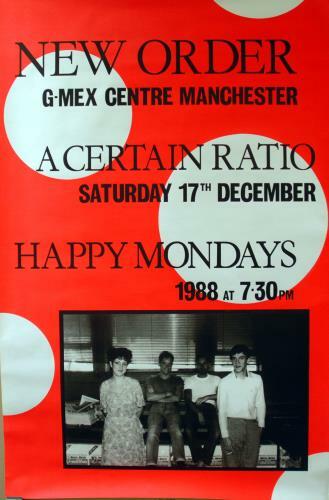 NEW ORDER G-Mex Centre Manchester 1988 (Very rare, genuine, late 1980's UK billboard poster for the concert held at G-Mex in Manchester on Saturday 17th December supported by A Certain Ratio and Happy Mondays. Measuring 38" x 60", this rare example is printed to very flat, very matt finished paper. The print colour and white background remains bright and fresh and it is free of pinholes, sellotape and any damage having never been displayed previously. There is just some very light creasing to edges evident from long term storage. It remains a spectactular poster absolutely worthy of framing and display).